Jesus said, “I have come that they might have life, and have it to the full” (John 10:10). Our world tries to force us into busy schedules, endless to-do lists, and expectations that don’t fit who we are. But simply having a full life and experiencing life to the full are two very different things. That’s why this journey we’ve taken together matters so much. A purposeful existence never happens on accident. We must choose it every single day. As a runner I’ve learned this: The hardest step is not the one across the finish line; it’s simply the next one. It’s often when we’ve made some progress and we’re about to hit our stride that we suddenly want to stop and eat a hot fudge sundae. Those are the most critical moments and to push through them we have to remember why we’re running in the first place. That’s what the You’re Already Amazing LifeGrowth Guide Book Club has been all about. It’s about discovering your strengths, skills and who you’re called to serve. It’s about understanding where you are now and where God wants to take you. It’s about putting into words your life purpose so you can be affirmed and empowered. I want you to finish strong. I want you to finish well. I want you to hear, “Well done, good and faithful servant. Enter into the joy of your Lord.” But for now as we wrap up I simply want you to take the next step. If you want to review the posts you can find all of them here. And if you’re just joining in, you can still go through all we’ve covered at your own pace. You can also use the book club content with a group if you’d like to host one. Thank you for joining me for our first Book Club! P.S. Congratulations to the winner of last week’s giveaway, Barbara Honea! Thank you for “When Mother’s Day is Difficult”. My story is different, in that I have lost my 40-something year old daughter, not through death, but by her choice to remove herself from my life. She won’t discuss this with me, but I suspect she has made this decision due to having heard about one or more of the horrible mistakes I made when she was a very young child. So, my sorrow isn’t due to the death of my mother or miscarriage, but it is my own fault, and this has given my grief an entirely different dynamic. I have been haunted by this and miserable for several years, and have been praying constantly for peace and acceptance, since I have no control over her feelings. I believe a few months ago God answered my prayers; there was a day in which a distinct feeling of acceptance came over me, and although I am still grieving and remorseful, I know I can’t change the past, all I can do is try to be the best person I can in the present. Adding to my grief is that I believe someday, when I am no longer here, she will most likely regret her lack of forgiveness and lack of relationship with her mother, and she will experience grief over her own bad choices. 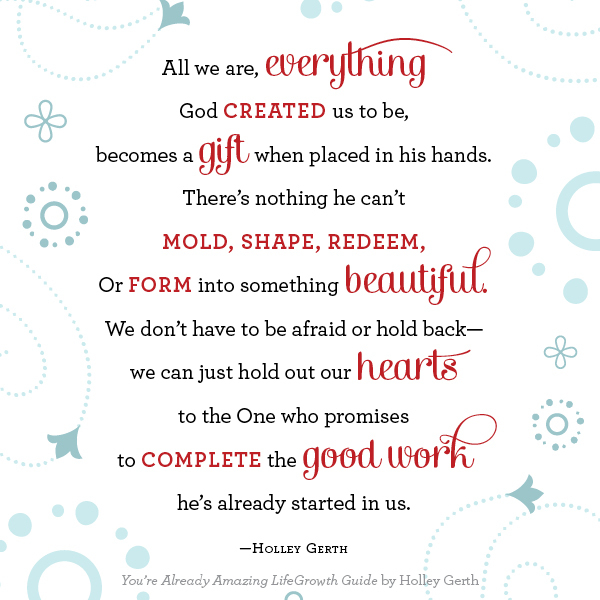 I don’t know….anyway Holley, thank you for your thoughtful and wise article… and my God bless you. Robin, The thing is my own mother has told me this many times. We all have to make our mistakes and most of the time we have to remove ourselves from our parents life just to make these mistakes. I have done this when it came to my own mother because I removed myself from my mothers life for almost two years and I wish I hadn’t but I had to make my own mistakes. So just give it time, she will realize when she will need her mother again. Your Mother’s Day article is beautiful, I put it on Pinterest. I pray it blesses and brings help to hurting women. Adoption, though it is not like having your own child, you can grow into that and love one just the same. There are so many children in need of adoption. There was three year old girl here recently taken from living under a bridge with an addict mother. Many of these people are so unfit, the courts would sever parental ties, leaving adoption the best choice. These children may have behavioral problems, and it takes time and work to undo the abuse and neglect, but a loving mother and father with God’s can help do that. So if someone, has the finances and faith to take that challenge, I pray they consider it. They won’t have to look far or even go outside the country to find a need. May God bless the hearts of Mother’s everywhere with His grace and peace,and give them His joy. I believe my next step has to be taking better care of myself as for the last so many years I have been a caregiver for my aging parents and it never seems to be in place I have found I am really falling behind in making it a priority to really take care of myself so that I am doing right by myself and my other responsibilities. So if my sisters in Christ are inclined lift me in prayer as I attempt to hear what the Holy Spirit has for me to hear and I will be lifting your prayer petition’s as well Blessed Monday everyone! “You’re Already Amazing ” has made me realize that I am special to God. It doesn’t matter what other people think about me. It only matters what God thinks. As a single young woman, I’ve decided to devote my love to Jesus. For I know with or without a husband, one day my reward will be the words,”Well done, my good and faithful servant .” Heavenly bliss will outweigh any earthly reward offered by man. When the Day Spring email arrived in my inbox, I was hoping for a new word of encouragement for an ongoing pain. I understand the areas that you addressed and how difficult those must be. But there is another group of us out here that find Mother’s Day difficult: Mom’s who have children that have distanced themselves or who desire no contact or relationship with their Mother’s. It is an unspeakable pain that many face everyday. It is a different type of loss that many of us can relate to but really wish that we didn’t have to. In our time together, I have realized, there are a lot more people who has dealt with kind of problem I have dealt with. There are more people who understand what I am going through when I think there is no one out there who I can talk to. Every day I think its getting easier and easier but there are days where I don’t think anymore because I think of him too many times, I try to stay busy so I don’t have to think but its difficult. Every Day is a new day and it brings a new beginning. Another day to get over this heartache. I have stopped crying every day, its every other day so one step at a time. God’s nature helps me a lot. Going out and enjoying the day outdoors and looking at the trees and the creeks are peaceful. I just wish there were more spots like the ones I been at cause then I don’t have to hear cars driving by and such like that. For many years, I celebrated Mother’s Day with great joy as God blessed me with 3 beautiful children. But then after losing my eldest son suddenly and tragically some years ago, Mother’s Day became a difficult day for me. God has helped me heal but sometimes it can still prove a difficult day. I am now aware that many mums have this same experience on Mother’s Day and hold them up in prayer as you all can do for mums like us. Thanks for sharing your article, Holley. Thank you for your books and online book club. I live in New Zealand, and your publishings are so encouraging. This year has been a trial in many ways, but God is seeing us through. You are Already Amazing has made me stop and think again of how God looked at His creation and said, Ït is good”, so whee is my concern? Back in God’s hands, under His control, so it is over to me to leave it there, and trust Him only, not day-by-day, but moment by moment. Praise God for gifted people sharing, and leading us to them.